iOS 10 is a tremendous update and an ark of new features from Apple. We have tried to cover some essential tips and tricks about iOS and its features. iOS 10 has come with a newly updated Lock screen plus Control Center, an App Store and Siri. This is not the end, in fact it’s beginning. There are plenty of slighter features in iOS 10. 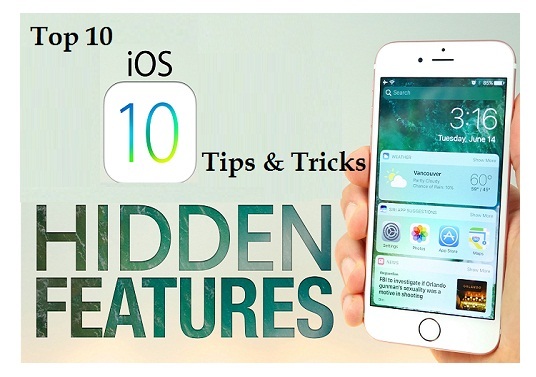 Stick around this article to get best iOS 10 tips and tricks. If you are new with iOS 10 then you must know that at first you’ll be presented on a Home screen. We’ve find that unlocking change the most jarring. Unlocking our iPhone and iPad has mostly remained the same process over the years: swipe right and enter your passcode. With Touch ID now firmly entrenched on all new Apple devices, Apple has decided that the swipe to unlock gesture is no longer required. Instead, you can swipe right to access a Widgets window (similar to Notifications in iOS 9), and swipe left to access Camera. These gestures are more intuitive than the current ones, but it’ll take a while it to become instinctive. As for unlocking the iPhone, you now press the Home button in and keep your finger held on the button for Touch ID (or enter your passcode if requested). While we’re on the subject of unlocking your iPhone or iPad, here’s a quick tip. If you’re sick of having to press the Home button (the sheer physical labour of it!) and prefer to just lightly rest your fingertip there like you used to do in iOS 9, open the Settings app and go to General > Accessibility > Home Button and tap Rest Finger to Open. Like the Apple Watch, iOS 10-equipped iPhones spring to life when you lift them up – handy if you’d just like to check the time or your recent notifications. But bear in mind that Raise to Wake requires an M9 motion coprocessor or later, so only the iPhone 6s, iPhone 6s Plus, iPhone SE, iPhone 7 and iPhone 7 Plus will be able to use it. Raise to Wake can occasionally be a pain: when out jogging in the dark we became anxious that the iPhone 7’s unpredictably lit screen would be a mugger magnet. You can turn it off in Settings. Go to Display & Brightness and then tap the slider next to Raise to Wake. The Widgets window displays app information on your Home screen without having to unlock your phone. By default it displays weather, time and information from Calendar, News, Music, Batteries and Reminders as well as Siri App Suggestions. Tap any option to open the associated app. You may be asked to use Touch ID or Enter Passcode. The Control Centre has been split into two windows, making it less baffling to the eyes. Slide up from the bottom of the screen and you’ll see options, screen brightness, AirPlay and Airdrop (as well as shortcuts to Camera and Clock). Swipe to the left and you’ll move over to media controls, volume controls, and an AirPlay list. We like this new look; it keeps things neatly organised. It’s easy to quickly filter your emails in Mail so you only see unread messages: tap the circular icon at the bottom left of the screen. It will become filled-blue (instead of just outline-blue) and you’ll see a message reading ‘Filtered by: Unread’. Tap the icon again to turn the filter off. While we’re talking Mail, what do you think of the new way iOS 10 Mail organises email threads? Instead of showing each message individually, it groups linked emails together. Tap the email and you’ll see all the linked messages organised in a thread. This is better in some ways – if you’ve been getting a lot of emails from one particular threads, it stops those messages from filling the screen and obstructing your view of unrelated messages – but some people (such as Chris Phin, who pointed this issue and its solution out on Twitter) prefer the old system. To open up a thread within the Mail app you just need to tap the little blue right-pointing double-chevron next to the email in question – it will point down instead, and show the full thread. Tap it again to close the thread back up. If iOS 10’s Mail threading really does you head in, turn it off completely. Go to Settings > Mail and then tap the green slider next to ‘Organise by Thread’. This is a handy tip if you’re downloading a lot of apps at once – when setting up a new device, for example – but you’d like to use some of them before the rest have finished downloading. Do a force-press on the icon of an app you’d like to be shunted to the front of the queue, then select Prioritise Download. Alternatively, you can select Pause Download on the apps that you don’t care about so much. We’ve tried using this feature on an iOS 10 iPad with a long-press, but sadly it’s 3D Touch-only, and therefore (at present) iPhone-only. There are a few exceptions. Find iPhone, Safari, Phone, Messages, App Store, Settings and a few more apps cannot be removed. But you can get rid of Apple Maps, FaceTime, News, Tips, Stocks (hooray!) and even Contacts and Calendar if you want. Apps you ‘remove’ are actually hidden and remain on the device with no icon, but to bring them back you still go through the process of ‘downloading’ them from the App Store. Open the App Store app and search for the app. When you click to download the app it’ll simply reappear on your device. The ability to sketch out messages was first introduced on the App Watch. It’s a fun feature, but bound to find many more fans now that Apple is bringing it to the iPad and iPhone. Open Messages and tap the Sketch icon (shaped as a heart with two fingers). Sketch a drawing on the black rectangle and it’ll be sent to the other person. It’s sent as an animation, so they see your finger sketching it out as it goes.